Your hotel in Mantua: Albergo Bianchi Stazione welcomes you into a warm, friendly atmosphere. Located in the heart of Mantova in a building dating from the 1400s, it will make your stay a pleasant one and will let you discover the magical atmosphere of a city rich in resources and culture. Every corner of the city is enchanting, romantic and rich in history. 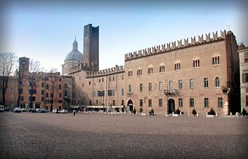 Ther are many works by great artists, of the calibre of Andrea Mantegna, Giulio Romano, L.B.Alberti, Rubens, Pisanello, which you cannot miss on your visit to Mantova. Whatever reason brings you to Mantova, you will fully enjoy this journey through a city to be discovered. We await you at the Albergo Bianchi to render your stay relaxing and pleasant. WHY BOOK FROM OUR OFFICIAL SITE! - Guarantee to find the best available rate. - Total security with encrypted booking system and maximum protection, without any charge. BOOK FROM OUR BOOKING ONLINE! You’ll find the best prices on the web and you’ll have a cake typical in homage. Check now our availability. Alternatively the Booking online can Contact via Phone or E-MAIL. PRIVATE PARKING INSIDE - Hotel Bianchi is located opposite the station at 50 mt. congress center MAMU and 150 mt. the seat of the University. We make agreements with companies or institutions. A city of great history and suggestion, Mantova has been elected by UNESCO as a world heritage site of humanity, along with Sabbioneta. Thanks to Gonzaga, it became one of the artistic and cultural centres of the Rennaisance, the buildings, the squares, the works of art are evidence of its glorious past. Mantova continues to be the beating heart of events: from Festivals of Literature to numerous concerts, as well as various shows and exhibitions, the city offers its best throughout the year so much so that it has been nominated the “City of festivals”. From the cradle of the Rennaisance, faded, to a reborn capital of culture, capable of attracting almost 500 thousand visitors a year. 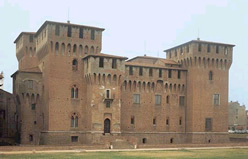 The idea of the organisers follows that of the Mantova of Gonzaga, who was able to bring writers and artists to the city who invested in culture. In this way “Festivaliterature” was born (which has become an ever-growing international event), the European Festival of Scenic and Urban Theatre, MantovaDance, Signs of Infancy (an International Festival of art and theatre of Infancy). Not to be forgotten is the great enogastronomic tradition, made up of typical dishes and very special tastes: it is impossible not to be tempted and won over by it. Framed by Mincio, Mantova always reveals itself to be a place to discover and rediscover.